I have sometimes been accused of hyperbole and a tendency towards superlatives and excessive enthusiasm. But I don’t think I can tone it down when it comes to food and the sheer beauty of the things that grow and nourish us. It’s gray and cold these days, yet I am surrounded by edible beauty of every kind. Out my back door, I can see eight-inch garlic sprouts bending from the heavy rain, surrounded by dark soil and a few weeds. They’re beautiful, those pale green stalks, and I look forward to the wet April day when I pull one of them out of the still-muddy and cool soil and chop it, sauté it in butter, and mix it with scrambled eggs. The seed catalogs that have started arriving in the mail showcase a more obvious beauty: stunning piles of peppers and tomatoes and melons that make you almost smell and feel the warmth of summer. But those catalogs also have entries such as these: “Possibly our most beautiful heirloom squash. This flattened, round fruit has gorgeous, salmon/peach colored skin covered with large warts!” Large warts!? A friend of mine gave me this very squash (Galeux d’Eysines) a few weeks ago, and they’re right: It is gorgeous. Right now, I’m most struck by the beauty in the least likely places, like my muddy, drenched garden and the warty squash in the basement. These things make me happy during the cold, wet months when I’m not in the garden or outside as much as I would like, when I don’t have piles of tomatoes and peppers to work with. And the winter farmers' markets in our region might make me even happier (here I go with the superlatives) than the summer ones. Because seemingly against all odds, the most gorgeous piles of dark, crinkly Tuscan kale, gnarly celery root, and baseball-bat-sized leeks are there, week after week. They are either thriving in these cool wet times or have stored up all of summer’s warmth (the winter squashes) to feed us during these short, dark days. Maybe I love them because I can already taste the delicious things that jump into my mind (the kale I sautéed and mixed with pinto beans and garlic) when I see them. And maybe their beauty entices the reluctant or tired or uninspired cook to take the time to make something with these beauties. 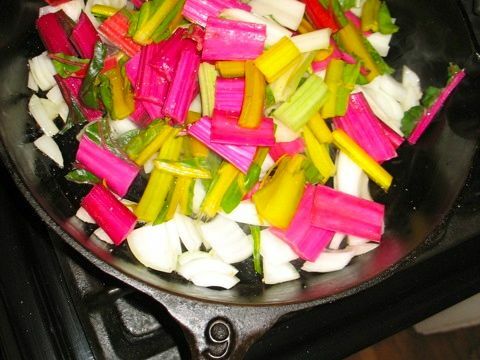 I’ve photographed chard stems and onions sautéing in a pan half a dozen times, because over and over again I am struck by their good looks. I guess it’s impossible to separate the beauty from the taste and from the process of preparing food. But those flashes of color and the dozen shades of green this time of year literally make me smile before I ever have a bite. Here’s a favorite winter recipe to use up some of that winter squash. Use the most beautiful of lentils, the red ones, and turn them into something satisfying and warm and, yes, beautiful, at least to the eye of this beholder.